A sale of Old Masters & 19th Century Art at Christie's promises an exceptional selection of European paintings and sculpture from the defunct Salander-O'Reilly Galleries, based in Manhattan. From the collection of bankrupt New York art dealer, Lawrence B Salander, the sale follows an auction of his antique furniture which raised $472,067 for Salander's creditors, earlier this month. According to Christie's, the collection will be sold in line with a Chapter 11 plan approved by the US Bankruptcy Court. The auction takes place on June 9 in New York. Salander's loss will offer great gains to collectors - the auction boasts a total of 130 Renaissance era and 19th century works. Big names in the collection include paintings by Sir Peter Paul Rubens, Palma Vecchio, Jacopo Bassano, and the studio of El Greco, among others. 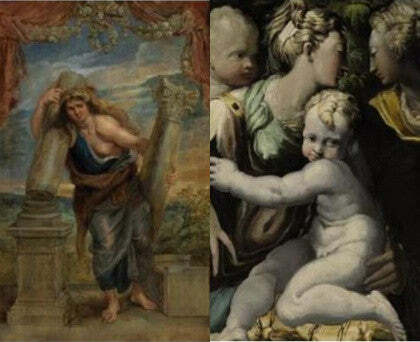 Among them is Vecchia's Imaginary Self-Portrait of Titian, estimated at $100,000-150,000 (a detail of which is pictured top right). Both Salander and his Salander-O'Reilly Galleries were declared bankrupt in November 2007. According to prosecutors, he was arrested for defrauding his art buyer clients to fund a lavish lifestyle. In other Rubens news, his painting A Commander Being Armed for Battle from the childhood home of Lady Diana Princess of Wales will appear for sale at Christie's this summer. It carries a pre-sale valuation of £8m-12m.